So this is the result of my second participation in Ludum Dare. 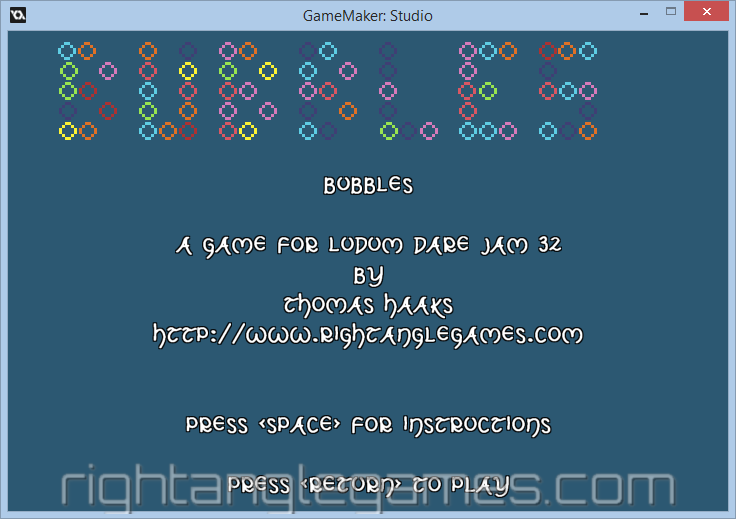 This page contains the HTML5 version of my LD 32 entry "Bubbles" to play with. Have fun, I surely did while creating it! And don't forget: this game was created just by me (all coding, all graphics, all sounds made with a microphone and my own voice) in around 40 hours, including sleeping, eating, cooking and so on! Below you'll find download links for the source code, a Windows executable and a little post mortem. 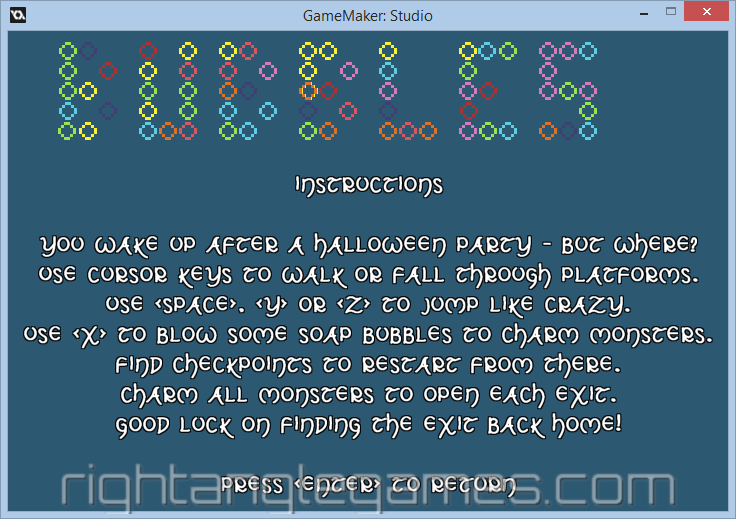 Just in case you can't get enough of "Bubbles" and want to play it on your computer all the time here is the link to a standalone executable for Windows. Just double click the exe and enjoy the game! Post mortem - what went good or wrong? Over at Ludum Dare it's pretty common to wrap up the coding marathon with a little review, named a post mortem. To let visitors of my site (you, for example) also find them, I'll place them here. 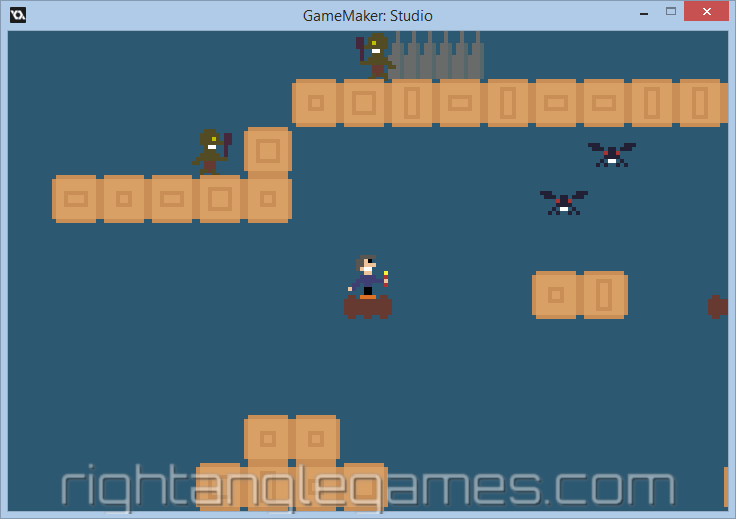 Choosing GameMaker:Studio again. I'm getting comfortable with it (though I still think a programming language without OO features is crap!) and that means I'm getting results fast! Using the GameMaker community. After I came up with the game idea and the platformer game type it was pretty easy to find online tutorials that helped me implement a platformer engine pretty quick. 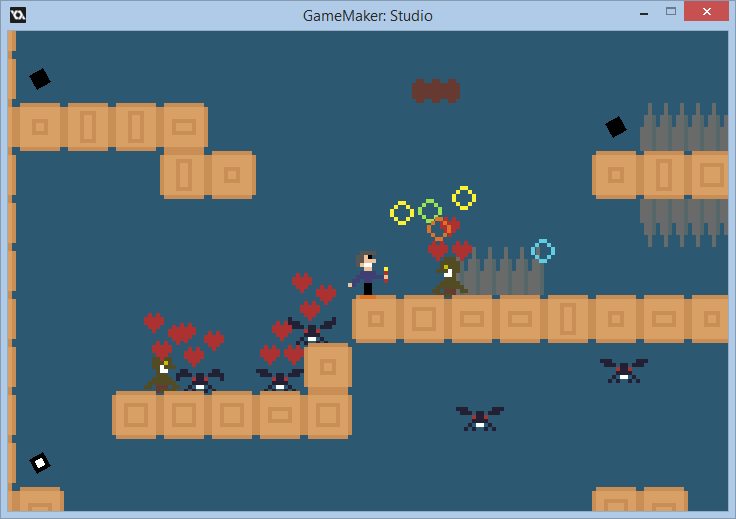 After a few hours I had a working prototype including first pixel sprites! Trying PyxelEdit. While creating my pixel bitmaps with the builtin sprite editor of GameMaker I was annoyed that it's so hard to have a look at the other animation images of a sprite. So I remembered I've purchased PyxelEdit several months ago and decided to give it a go. Two intro tutorial videos later I was working really fast with the tool (keyboard shortcuts are great to learn!) and used the tool for all remaining graphics work. Creating sound effects on my own. All sounds you hear were created with just a microphone and a bit of cutting and pitching with Audacity. That was really funny - first time I tried that at all! Having a day off on Monday. What a relief! I knew that I could spend the whole Monday to do all household and cleanup work that was left over the weekend. Also I didn't need to iron my shirts for the week on Sunday evening but could delay that til Monday. And I didn't have to go to bed early - which was a real life saver if we come to the "What went wrong?" part! So I can only recommend to others and try to remember for myself to have a free day after the LD weekend! Music. Again. This time I had a few more hours left (I thought!) and tried to create some music. Only tool that I was a bit used to was Music Maker Jam on my Android tablet. But preset loops, some effects and changing chords just didn't do it - nothing fit the game so I dropped music completely for my LD entry. Again. Disappointing. I will try to learn a bit of FL Studio and use that for simple game loops. Next time. Graphics. Hmm? I mentioned that on the "What went right?" part, didn't I? Yes, but in fact I wanted to create graphics using Inkscape. But that didn't work - I'm just not experienced enough with Inkscape yet to use it fast enough to achieve what I want to create. Too much fiddling around or looking things up here - so back to pixel graphics it was. That's pretty much it. Hope you enjoyed the read and maybe you'll give it a try too - create a game in 48 hours (or less)!